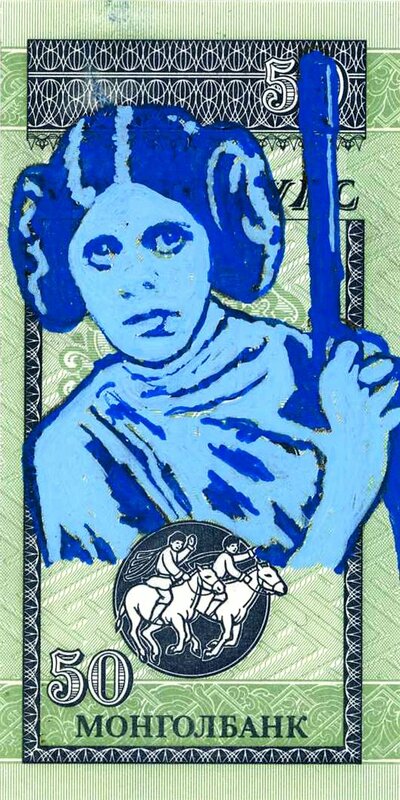 This is my latest art on banknotes... The Four Seasons is a set of 4 notes... Like winter, spring, summer, and fall... The bills are from Mongolia, circa 1993, and too small to really do a masterwork upon... So pop art portraits to a seasonal theme... yay! Winter is Carrie Fischer, or Princess Leia Organa... I will probably fix her nostrils before it is sold, but it is close enough for postage stamp size! This set of moneyart is available at my shop... Please buy it, as I could stand to buy groceries... My food stamps got cut off because I didn't file some form with them, explaining I have autism... I have filed this form before, but I moved last summer, and apparently the counties won't talk to each other... Jeez!